There is still a small window of time left of summer. 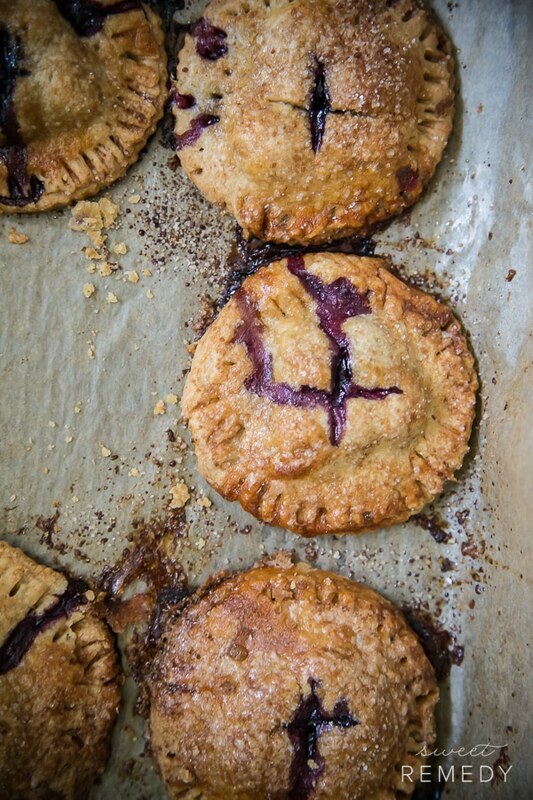 Enjoy these Blueberry Sage Hand Pies before that window closes and the fresh blueberries disappear! I know you guys, it is mid-September already and I am jumping back and forth between summer berries and pumpkin. 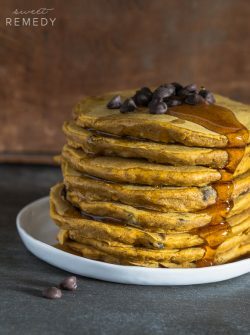 We can get back to the pumpkin pancakes and pumpkin pie spice tomorrow. It’s actually still pretty hot out there. Except for at the beginning of this week there was quite a cold front. I for once was thoroughly enjoying the chill in the air. But today… it is back to being very hot. 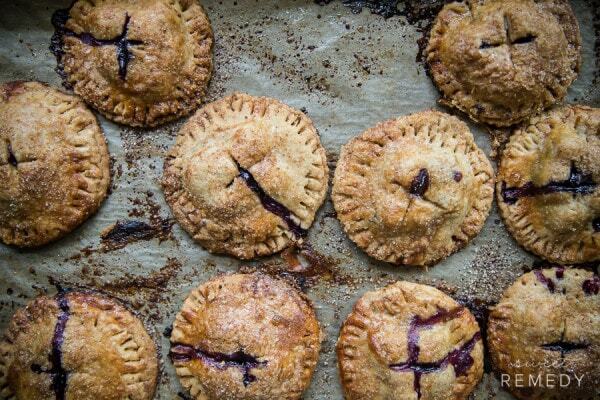 So it feels okay to share these Blueberry Sage Hand Pies. They are made with the Whole Grain Pie Crust that I shared yesterday so be sure to check that out. 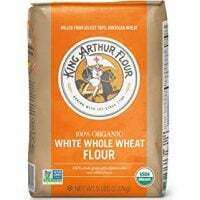 If you aren’t a fan of whole grains, you can make this recipe with your own favorite pie dough recipe. 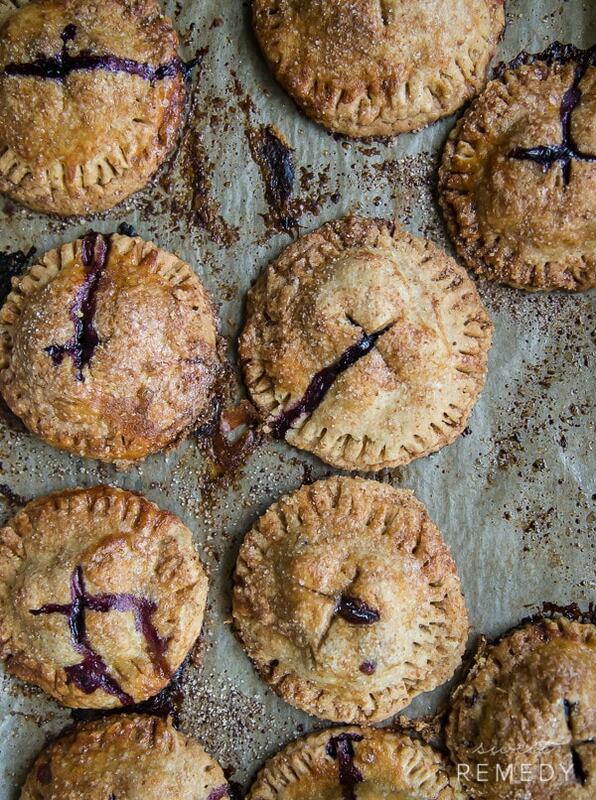 This recipe, minus the pie dough is really easy. It is almost silly to call it a recipe. 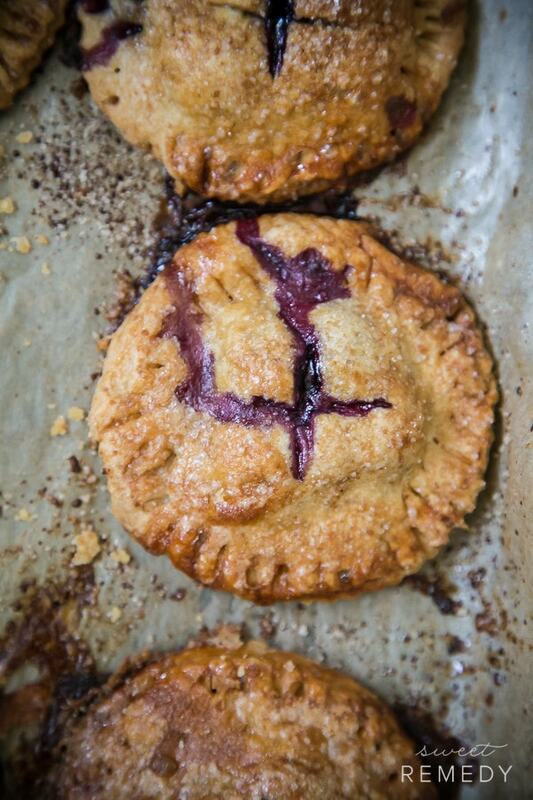 Just mix together blueberries, sage, flour and some sugar and fill up a pie. 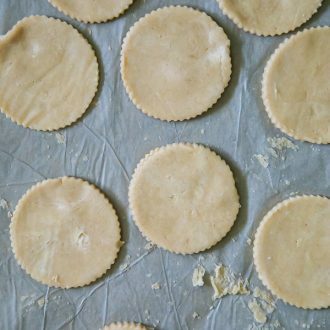 You could even use some pre-made pie dough if you are in a hurry. 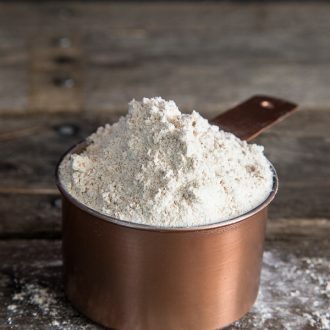 Just find a pie dough recipe you like and make it a few days ahead while storing in the fridge. Just be sure to brush the finished pie with an egg white and to sprinkle some sugar on top. This makes it brown up really nicely and become extra sweet and crunchy. Just the way that the crust of a pie should be! 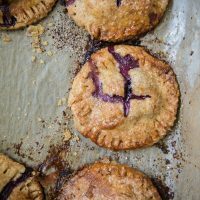 These Blueberry Sage Hand Pies are made with a whole grain crust that is made with good for your whole grains. 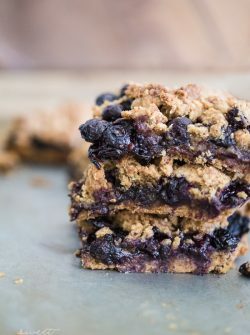 The blueberries are perfectly paired with fresh sage to create a dynamic taste. 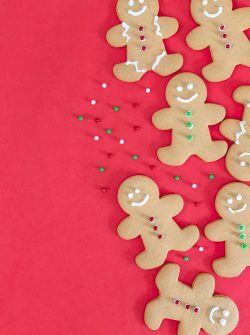 Line a baking sheet with parchment paper and lightly grease with butter. Crack the egg and separate the yolk from the white using a small bowl. Discard the yolk or set aside for another recipe. Set aside the dough and the egg white. 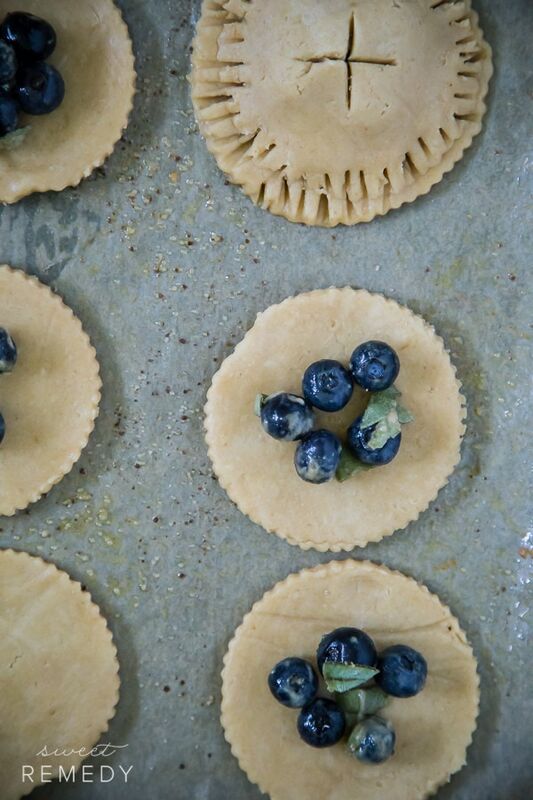 In a small bowl, mix together the blueberries, sage, whole wheat flour and the sugar. 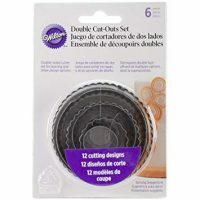 Cut out the circular pie shapes with a cookie cutter. Fill one circular shape with as much of the mixture as you can fit. Put another circular shape on top and seal with a fork. Cut two intersecting lines onto the top of the hand pie. 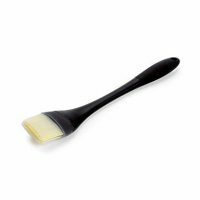 Using a pastry brush, brush the top of the dough with the egg white wash.
Sprinkle the top of the hand pies with the extra sugar. 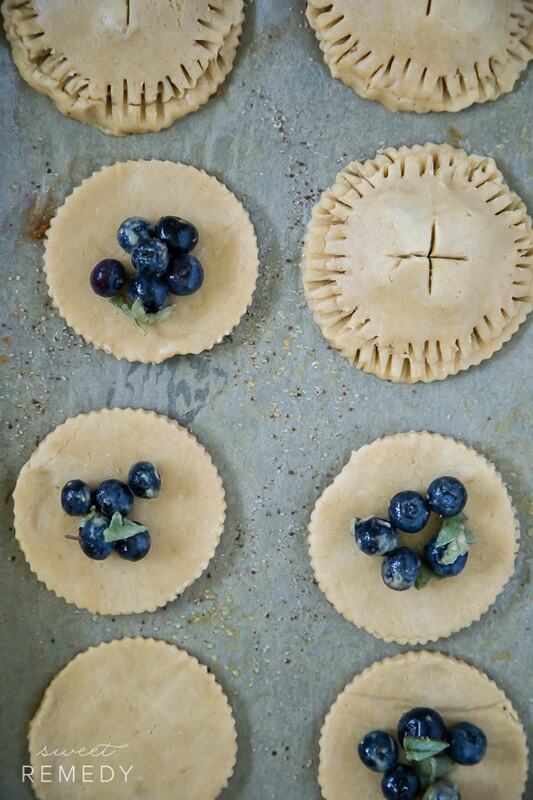 Place pies onto the prepared baking sheet and bake for 25-35 minutes or until tops and sides of each pie are golden brown.